The more I log onto social media lately, the more I feel as if life is passing me by. It seems as if everyone else is living out their goals and doing the normal tasks that comes with adulthood. The normal tasks are falling in love, getting married, having babies, and getting paid enough money to handle the lifestyle. I, on the other hand, feel stuck in this work and go home alone cycle. It would be okay if I was 20, 22, or even 24. However, before this year ends I'll be 30 years old. My 20's will be over. At 29 I have this baby fever, this yearning for the man of my dreams, and of course a desire to have way more funds in my bank account. Wait, I'm not just wanting to have more money. I want enough money to where I can actually go to some of the interesting events I want to be at. I want to have enough money to where if I wanted to move to another apartment complex tomorrow I could without any worries. I want enough money to where I don't have to worry about over spending. Since I want to be a parent, that'll be whole lot more than I'm currently getting paid. Wait, I'm going off topic. Anyway, I've been seeing all these great accomplishments others are making and it's absolutely time for me to make some. But I'm not thinking of the normal goals people do to push themselves further. I'm tired of having this goal of moving to California or some other state only to realize there's a brand new bill I'm taking on and have to figure out how to manage. That's stressful, so I'm thinking of some goals that aren't as stressful to accomplish before turning 30. Earlier this year I published a book via CreateSpace. For years people had been asking me when I was going to come out with a book. Because poetry is what I'm best at writing, it was a poetry book. However, the part of getting people to actually buy the book has been tough. A lot of folks congratulated me, but they didn't realize the way to stroke a writer's ego is to purchase the writer's new book. So I've needed to burn off some steam and find a new creative outlet. The guitar is the answer. I purchased the guitar this weekend from Guitar Center. It's a rogue starter acoustic guitar in the color blue. It's very pretty, but they didn't have it in the store. 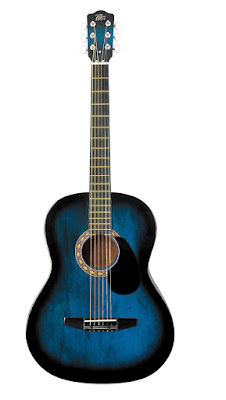 So I will officially have a new guitar next weekend. The plan is to combine my playing of the guitar (I have to learn) with poetry and record it for youtube. Learning how to play the guitar and putting it up on youtube for the world to see will distract me for a minute from the stressful business of book selling and trying to add extra money to my bank account. One of the reasons why I was able to create so many blog posts in the past is because I wrote without caring about the structure. I wrote to get interesting words out. Lately I've struggled to write because I want to be noticed by the masses. I want to be taken seriously as a writer. However, in order to keep writing I have to just do it without thinking about how it looks to others. With hat being said, I'm be back with more before 30 goals later.